It’s no more a rumor that PayPal has accepted Nigeria but is very difficult to link Nigeria Debit Card with it due to certain error. Now I'm happy to tell you they have resolved that error and you can now link your Naira Master Card to your PayPal Account easily. Although, it is not possible yet to send money directly to other PayPal users and you can’t receive payments directly to your PayPal account, at least for now, you can pay for products and services on sites that accept PayPal. Log on to https://www.paypal.com/ng/ and click on "Sign Up"
» You might see a security challenge, type the characters you see in the image and click "Continue". » You will then be prompted to enter your card details. Enter the card number, the expiry date and the 3 digits at the back of the card in the spaces provided. Ensure the billing address matches the address you used to open your bank account. » Click "Continue" to proceed to your account. » Sign in to the email account you used to register and click on the "verification link" in the mail sent to you by PayPal. 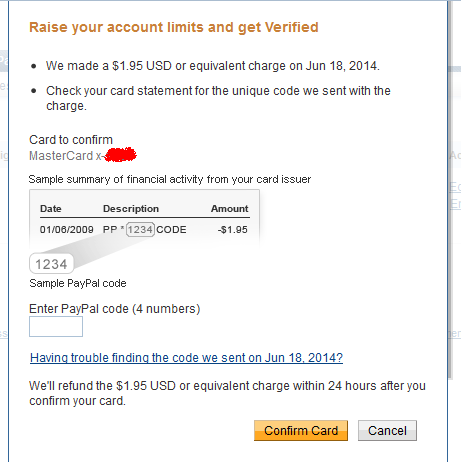 This might prompt you to enter your password for you to sign in to your PayPal account. » You will be redirected to a new page to confirm your card for verification. The card type, the last four digits of the card to confirm and the billing address will be displayed. Click on "Continue" to proceed. » After clicking "Continue", PayPal will charge the card $1.95 (about N320) to make sure it's yours PayPal, but don't worry your money will refund within 24 hours after you confirm your card. » Wait for the debit alert from your bank via sms or email and you will see a 4-digit code associated with the PayPal charge, it looks like (PP*1234CODE). » Just note the 4 digits code inside it like that 1234, log back in to your PayPal account and click "Confirm my debit or credit card"
» Enter the 4-digit code from your card statement in the space provided and click "Confirm Card" button. » If successful, you will see the confirmation message as in the screenshot below. » And your PayPal account status should now turn to Verified. that is so simple isnt?. You can now start using your PayPal account to buy goods or paying for service online. No need worrying yourself about funding the PayPal account for now. When you use it to make payments, the credit or debit card linked to the PayPal account will be charged. Hope you have verified your PayPal account too? Which Bank Card did you use? Please, let me hear from you through the comment box.